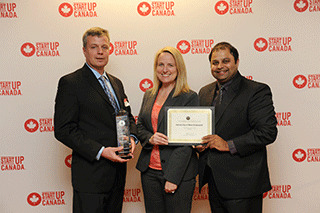 The University of New Brunswick (UNB) was named Post-Secondary Institution of the Year at the 2014 Startup Canada Awards on Thursday evening in a ceremony and reception atop the CN Tower. In the last 25 years, UNB has emerged as a hotbed of innovation and entrepreneurship in Canada by combining experiential education with opportunities for mentorship, skill-development, leadership and commercialization. UNB President Eddy Campbell says this award is tied directly to the innovation agenda in New Brunswick. “This is really a win for the entire entrepreneurial ecosystem in Atlantic Canada and an endorsement of the culture of innovation that is booming in this province,” said Dr. Campbell. Thanks to investment and support from government, non-profit and community partners, UNB has launched 10 startups in the last three years and has 12 more in the development stage. Gerry Pond, visionary entrepreneur, investor, philanthropist and co-founder of UNB’s Pond Deshpande Centre, also received a Lifetime Achievement Award from Startup Canada for his commitment to uniting and strengthening the entrepreneurship community in Atlantic Canada. Dr. Dhirendra Shukla, chair of the J. Herbert Smith Centre for Technology Management and Entrepreneurship, accepted the award on behalf of UNB. “While our faculties of business, and institutes like the International Business & Entrepreneurship Centre, Pond-Deshpande Centre and Wallace McCain Institute deserve special recognition for our stature as the most entrepreneurial university in Canada, this award really belongs to the network that surrounds and sustains the talented and passionate minds at UNB,” said Dr. Shukla. “We're part of a tremendous entrepreneurial ecosystem in Atlantic Canada and supported by government and community partners who believe in the power of innovation and entrepreneurship to drive social and economic change.